This is the post you've all been waiting for! That post I mentioned I wanted to wait on writing, about my race Sunday. I wanted to wait so that I would say anything based solely on agitation that I would later regret. After giving it a few days however, I mostly feel the same way. People in my local running community can easily figure out who this guy is (even if I post a photo with his face and bib number blurred out) and maybe they've even had an issue with him in the past. I was so disappointed to find out that this guy is an very experienced trail runner, he should be ashamed of himself, the only excuse is if he has some kind of mental disability. Most of the time though, if that is the case, a friend can point out "hey, your behavior is not okay," let them know what they need to do differently, and they get it. I feel okay in posting this now because no matter who he is or how you look at it, the way he acted was not okay. 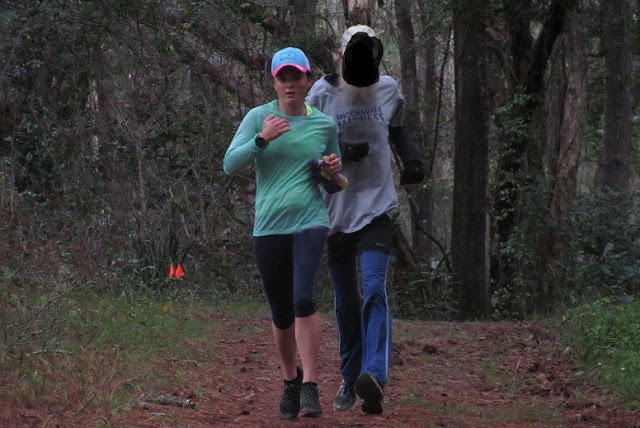 Instead of just pointing out all of the things he did, I decided to make this a fun list of how to annoy other runners in a trail race. 1. 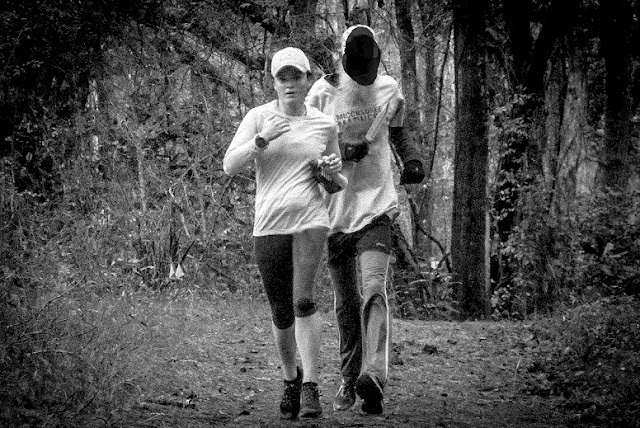 Randomly stick your arms out to the sides so other runners are afraid to try and pass you. 2. When another runner does pass you, act startled, even though they called out, "on your left!" 3. After you've been passed, speed up and get on that runner's heels. 4. Make sure to always pass on the right. 5. Never say anything when you pass another runner, especially since you're doing it on the wrong side. 6. After you've passed a runner, make sure to slow down to the speed you were going before they passed you. 7. When another shares some tips on proper trail racing etiquette, mumble something they can't understand while continuing to do everything wrong. 8. After following all of the above steps, let the annoyed runner behind you pass. Likely, they will then speed up to create some space between you and them. 9. Don't let them create a gap! Stay on their heels! Even if this means running 2 minutes per mile faster than you were when you were in front of them. 10. Don't pass them this time, since you can annoy them more from behind. Especially if you're an old man and they are a young woman and you're in the middle of the woods with no one else around. 11. When the single track trail turns into a wide service road, make sure not to spread out. Stay on their heels. 12. Though you now have plenty of room on the left, keep edging to the right, you only want to pass on that side! 13. (Lucky 13) This time you act annoyed, pass on the left because they won't make room on the right and take off, so you can beat them to the end of the first lap. I think we can all agree that this is not okay. Now, I guess I'll share the whole story. My race started off well enough. I usually start near the back half of the pack and this race was no different, especially since I was running the half marathon and knew many were doing the 6.5 mile race (one lap). My first annoyance had nothing to do with that guy, it was actually my iPod when it started saying low battery as soon as I turned it on. Bonehead move on my part, but I could deal. Little did I know at the time that that would be the least of my troubles. 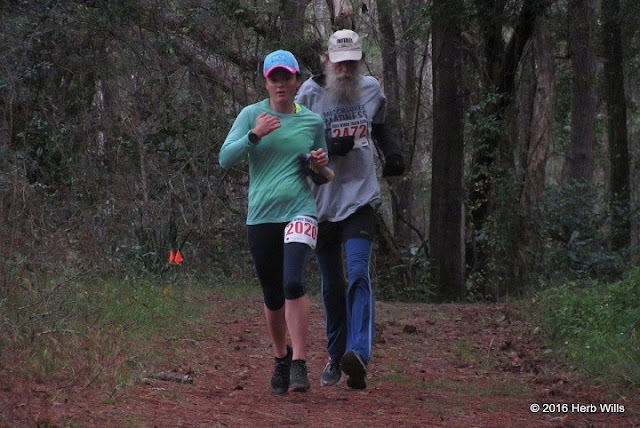 A mile or so into the race, which had been going smoothly, at least as smoothly as a single track race can, the path widened a little, I called out, "on your left" and passed a long line of runners at once. I'm feeling pretty good, the pack has spread out and now I'm passing one or two runners here and there. Then I get to him. (I've been in a race with him once or twice before, I remember people being annoyed at his passing on the right and failure to announce it. I also remember him having a very dramatic finish at one race.) He's not going much slower than me, so I stay behind him for a little bit. I like to leave a decent gap on trails, in case a runner in front of me were to stumble, I don't want to crash into them. It finally becomes apparent that I will need to pass him. So I say, "on your left" and pass, he grumbles and acts startled as if he didn't know I was there. I do run pretty quietly, but I did call out first. No more than a couple minutes later, he passes me on the right, without saying a word. This would have been fine, if you want to go faster than me, you should pass me. However, he passed me and then slowed back down. After giving him time to speed up, it was clear he wasn't going to, so I again called out, "on your LEFT," and passed him. This time I sped up more to create some space between us, but once again he sped up and passed me on the right, without saying a word. This time he immediately slows down. After waiting an appropriate (and annoying) amount of time to see if he would go faster, I asked him which race he was running, hoping I would be rid of him after the first lap. He mumbles something that includes the word "marathon," and motions for me to pass him (on the left, btw). Sure, this is better, but how much better? So, after passing him and figuring he's doing either the half or the full and I won't be rid of him soon, I say "you're going to have to stop passing me and slowing down." Those were my exact words and I did not yell. He mumbled something completely incoherent. As I sped up to make some space, I added "and it's customary to pass on the LEFT." This time I really wanted to create a gap between us, so I took it up a notch. Instead of staying at the pace he had been going, he sped up as well and stayed right on my heels no matter what I did. Now maybe he was making a point of being annoying? Or a point of not passing me because of what I said? I don't know, what I do know was that there was no longer any other runners around and I was getting super annoyed. I had sped up to 10:30 miles from over 12:00 miles behind him and he was still right on my tail. I could hear beeps right before my Garmin beeped, and with no one around but him I could only assume it was his watch, so he knew what he was doing pace wise. As we passed another runner who had stepped off to the side for a break, I said to her (for him to hear), "trip this guy for me will ya?" It was obviously ridiculous how he was following me. He grunted. He got closer. I thought that he was trying to pass me on the right again, and out of principal, I moved as far right as I could while still on a single track trail. If he wanted to pass, he had plenty of room on the left. He didn't pass. I stayed to the right. Nearing the end of the first lap, the trail widens into a service road. Now that the trail is wide enough for a truck to pass, I think finally, he'll get away from me. He doesn't. He doesn't even move to the other side of the trail. I'm still thinking he's trying to pass on the right, like he wanted to make a point of it, I don't know. What I do know is that this is super weird. I've even slowed down a bit now, knowing I can't sustain 10:30 miles for a half marathon, much less a trail one. I'm still going faster than he was when I was behind him. I'm on a wide trail, far to the right, no one is around except this one old guy who wants to stay on my heels for no reason. I know the view is great back there, but come on! Now, does this make it okay? The fact that we are in a race? Soon we pass a photographer, and I decided to say, "look at me, I'm being chased by a creepy jerk through the woods." Again, another grunt, but this time he passes, finally! On the left this time, since there was no space on the right. I worry for a second that he'll slow down again but he doesn't, he actually takes off. It's not until the end of the lap that I see him again, at which point he stops running and walks toward where cars are parked. At the time, I had all kinds of thoughts. I had debated quitting after that one lap, I was so annoyed and couldn't take another lap if it was right by him. My decision to stick with it was strengthened when I saw him step off the course. Had he decided to quit? Was he really only doing 6.5 and he had mumbled "quarter marathon" when I asked? Maybe he was taking a break. What I knew was that he was gone for the time being and I was glad. I was also glad I had chose to stick with it. My second lap was great. I really got to enjoy the trail and the nature surrounding it. I didn't have to worry about anything but putting one foot in front of the other. Lap two was very peaceful and I rarely saw another runner. When I did see someone else, we greeted each other pleasantly. When I got to the last water stop of the race (I believe there's less than 3 miles to go from that point) I decided to stop and refill my handheld. I wasn't in a big hurry, I was really enjoying the race at this point and chatted just a little with the volunteers. Here he comes. Another runner is not far behind him and I wonder if he's playing the same annoying game with him as he did with me. I get back on the trail and am able to finish my race in a good state without seeing him again. In hindsight, I've considered that his behavior may have had to do with ego. He didn't like being passed by a woman. Then, after my comments, he decided to keep pace with me so he could run ahead at the last quarter mile of the first lap, thinking he was beating me to the finish line if I was running the 6.5 (or creating space, so he didn't look like a creeper in front of a bunch of witnesses). He then had to step off course to take a break, I don't really know. I do know that only one other person passed me the entire race, and that was the runner that was right behind him when I was at the water stop. I also know that his name is not under the full marathon results, but under the half marathon, way below mine, no idea what happened there. Oh well, I don't race enough to care that much but it makes me want to avoid races he would be in. How do you know though? Ask the director? All this to say, don't be that guy. Have you ever had a bad experience with another runner during a race? What did you do about it?